Do you believe that a "monster" can be created by stitching together body parts retrieved from corpses and made alive using the technology of 200 years ago? This idea is based on Frankenstein, or The Modern Prometheus (1818), a novel by Mary Shelley (1797-1851), a classic in English literature. Reverend Hubert Venables in The Frankenstein Diaries (1980) attempts to make a convincing case that it really happened. In the 20th century "Frankenstein" was commonly assumed to be the name of Mary Shelley's monster. In her book, however, "Victor Frankenstein" is the name of the science student who created the monster. Mary leaves the monster nameless. She has him say: "Remember that I am thy creature; I ought to be thy Adam…" In Chapter 10 Victor Frankenstein addresses his creation as "vile insect", "abhorred monster" and "wretched devil". "Adam" and "vile insect" seemed unsuitable as names for a monster, as also do "Frankenstein junior", "Anonymous" and "Frank". Commentators as early as 1844 began to call the creature "Frankenstein" after its creator. Reverend Hubert Venables claims to have "the true story" behind the Frankenstein legend. His extensively illustrated book The Frankenstein Diaries (1980) purports to be an edited translation of Frankenstein's diaries from the original German, and the illustrations exact reproductions from the diaries. So nightmarish are the contents of the diaries that the Rev. Venables had severe doubts about presenting them for publication, though his research had convinced him they were a genuine record. The publishers are likewise convinced of their authenticity. Venables says a colleague in Switzerland sent him a "bundle of ancient, decaying papers" and that he has "established beyond all personal doubt the authenticity of the diaries as a true historical record of fact." He claims to possess the actual original diaries of Victor Frankenstein and that he worked on them for six years to produce the book. If you suspect that Venables is "having you on", "pulling your leg" or treating you like an idiot, consider that he is a "Reverend", or so he says, and would therefore be as true as his word. He is an "English parson in York" but his name seems an alias as it cannot be found with Google Search except as the author of The Frankenstein Diaries. Venables' book has portraits of key characters including Victor Frankenstein, Victor's mother, Victor's professor (M. Waldman), Victor's assistant (Igor), and the monster, and drawings of anatomy and scientific equipment Victor used, and of the castle [Schwartzstein castle] where the experiments occurred. There is even an undated newspaper report of a grizzly murder attributed to the creature, and a page from the diary showing Victor's handwriting. The diary format lets us see the events through Victor's eyes and the pages are faintly yellow to represent the age of the alleged diaries. If Venables is correct then Mary Shelley must have had access to the Diaries so as base her novel on them — but she nowhere makes such a claim. The subtitle of Mary's novel, The Modern Prometheus, alludes to Greek mythology in which Prometheus was a "Titan" who created mankind under instructions from the chief god Zeus. "Victor", i.e. Frankenstein's first name, was a pen name of Percy Bysshe Shelley (1792-1822) the poet-author whom Mary married in 1816. Percy's family was wealthy and distinguished, as is Frankenstein's family in the novel; and Percy had a sister named Elizabeth the same as Victor's sister (by adoption) in the novel. Mary's novel shows influence from John Milton's Paradise Lost, Samuel Taylor Coleridge's The Rime of the Ancient Mariner, and Element's of Chemical Philosophy (1812) by Humphry Davy, pioneer in electrolysis. Mary also knew about dead bodies being used for medical research and about Giovanni Aldini (1762-1834), Italian Professor of Physics, who gave demonstrations of electricity making corpses move. Mary travelled through France, Germany and Switzerland in 1814 with a stop 17 km from Frankenstein Castle (near Darmstadt). A century earlier alchemist and physician Conrad Dippel (1673-1734) had conducted experiments there with cadavers. Dippel was born at Frankenstein Castle and tried to buy it by swapping for an "elixir of life" he had invented. Although Europe has other places named "Frankenstein" the connection with corpses and a physician makes the castle near Darmstadt the obvious main inspiration for Mary's novel. The year 1816 saw Mary, her stepsister, and Percy staying with author/poet George Byron (1788-1824) and John Polidori (Byron's personal physician) at a villa alongside Lake Geneva in Switzerland — near where the Frankenstein family in the novel also had a house. In February 1815 Mary gave birth to a premature baby which soon died — perhaps additional reason for Mary to be dreaming about reanimation. The summer that year was long, cold and wet due to dust from the largest volcanic explosion in centuries obscuring the sun. Being housebound the group engaged in a competition to write the best horror story. During one sleepless night in June Mary combined events from her own life with her knowledge of literature and science and came up with a scientist who creates life. With Percy's subsequent help and encouragement she developed her horror story into a novel. Switzerland became the setting for most of the novel and the dreary weather of 1816 is reflected in Frankenstein's pursuit of his monster to the North Pole. Mary and Percy returned to England and married. Mary completed her novel in May 1817 and the first edition of 500 copies was published anonymously in London in 1818. They then moved to Italy. Mary Shelley's novel begins with a Captain Robert Walton writing letters to his sister in England dated "17—" i.e. in the previous century. Captain Walton writes he was attempting to reach the Pacific by ship via the North Pole when his crew saw a dog sled driven by a giant figure. Later they rescue Victor Frankenstein, emaciated and nearly frozen, from an ice-flow. He had been pursuing the giant man seen earlier. Frankenstein recovers from his near-freezing and tells Captain Walton about his life. • Frankenstein's pursuit of the monster to the North Pole. • The creature drifted away on an ice-flow into the night. The common belief that the monster was made from body parts of cadavers grafted together is not directly stated in Mary Shelley's novel. But it is implied because her Frankenstein says: "The dissecting room and the slaughter-house furnished many of my materials…"
Frankenstein in the novel does not attribute life to electricity, but to an unspecified discovery: "I succeeded in discovering the cause of generation and life; nay, more, I became myself capable of bestowing animation upon lifeless matter." Mary Shelley's Frankenstein became the inspiration for many subsequent books. None of the derivatives are likely to be factual since none are written by a Reverend or based on Frankenstein's Diaries. • Frankenstein Unbound (1973) Brian Aldiss. A 21st century American invents a weapon to stop war which instead sends him back in time to Switzerland in 1818. He meets Mary Shelley, Percy Shelley, their friend Byron, and the monster. • Frankenstein's Aunt (1978) A.R. Pettersson. Hannah Frankenstein goes to her nephew's castle to restore order but meets the Frankenstein monster, and Dracula, and a werewolf. • Frankenstein's Aunt Returns (1989) A.R. Pettersson. The monster is a child named Franklin who plays practical jokes. • The Frankenstein Papers (1986). 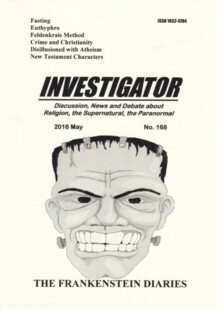 Author Fred Saberhagen describes the monster's viewpoint as it goes in search of its true identity. • The Frankenstein Murders (2008) Kathlyn Bradshaw, Cormorant Books. The many movie adaptations of Frankenstein are no more credible than the novels and should be watched skeptically. The first film was a 16-minute production in 1910 by Edison Studios in which Dr. Frankenstein creates his creature chemically in a vat. "150 years" means c.1830 i.e. about ten years after Mary Shelley's novel was published. Venables also writes of a discussion at university between Frankenstein and his professor, M. Waldman, where the latter refers to “the work of Galvani, Volta and the young Faraday.” (p. 16) Michael Faraday (1791-1867) did no noteworthy science until the 1820s and would not have been comparable to Galvani or Volta before 1827 when he published his book Chemical Manipulation. Mary Shelley’s novel mentions the same professor, Waldman, which implies Mary must have read the Diaries before writing her novel. But she couldn’t have had read them if they were written about ten years later! The Diaries don’t mention Mary and Mary never claimed to have read the Diaries or to have met Frankenstein. Another anomaly is that Mary's novel is set in the 18th century, meaning that the alleged diaries were written at least 30 or 40 years after the events in Mary's novel. We cannot rectify this anomaly since Venables supplies diary dates only by month and day of month, never by year or day of the week. Venables pinpoints the location of Frankenstein’s “Schwartzstein Castle” on a map (p. 44), but the “Varta Atlas” of Germany, a very detailed Atlas, shows no “Schwarzstein” anywhere. Venables outlines 19th century technology available to Dr. Frankenstein, illustrates the scientific instruments used, and explains scientific innovations in which Frankenstein was ahead of his time. He mentions organ-storage, tissue-rejection and even a brain transplant — problems not fully solved even today — and suggests Frankenstein solved them. The diary format, visual elements, and explanations of technology support Venables contention that Mary Shelley's book is based on fact and the monster was real. 4. No trace of any "Schwartzstein" Castle. Like Mary Shelley “Rev. Venables” has merely written fantasy but unlike Shelley he claims his fantasy is history.